AMDA | AMDA News - AMDA Alum Amanda Musso Talks TV with New Roles on "Modern Family"and "All Rise"
AMDA Alum Amanda Musso Talks TV with New Roles on "Modern Family"and "All Rise"
Amanda Musso graduated from the Studio Program at AMDA in 2005, landed her first job on “Two and A Half Men” and has been booking roles in Television ever since. She recently taped an episode of the Emmy winning “Modern Family” alongside fellow alum Jesse Tyler Ferguson, and is also working on a new pilot called “All Rise,” out this fall. We spoke with Amanda about her work, her days at AMDA and her dreams for the future. When did you decide you wanted to be an actress? Was there any specific moment that you can recall, when you knew this is what you wanted to do? I was lucky. Growing up my parents would take me to the Orange County Performing Arts Center to see plays and musicals. I remember the first show I saw was Annie and I thought it was magical, but it wasn’t until my parents took me to see Les Miserables that I fell head over heels for the acting world. I was entranced after seeing that show. I wanted to be Cosette when I grew up. After that, I threw myself into every play and musical I could find. And I won first place in my elementary school talent show singing “On My Own” from Les Miserables. After graduating high school I was unsure of where I wanted to go to college and what I wanted to study, but I knew absolutely what I wanted to do. I wanted to act, professionally. And I had wanted to move to LA ever since I was old enough to know that is where the magic happens. So when I heard there was an Academy where I could study acting, singing, dancing, writing, scene study, theater history, film, television, musical theater, and stage combat—well I was sold. It was everything I wanted and needed. I didn’t want to spend time taking classes I wasn’t interested in. I wanted to dive head first into studying and training in my craft, with teachers who are working in then industry themselves. AMDA prepared me for every kind of audition, whether it was a movie, TV show, play, or musical. It allowed me be a triple threat and have that many more doors open because of it. Tell us about your life after graduation and what you have been doing? After graduating I was lucky enough to get representation right away and start auditioning. I have booked many jobs along the way in film and television (“Life”, “Knight Rider”, “CSI:Miami”, “A Thousand Words”, “All My Children”, “The Closer”, “Modern Family”) and also in the theater. I spent all of last year working in Colorado at a history theater performing in George M. Cohen’s The Tavern and then as Magenta in The Rocky Horror Picture Show. Most recently I shot an episode for the new season of “Modern Family”. I was ecstatic when I heard I booked the job, it is my favorite show on TV right now! What an experience to work with such talented and veteran actors as Ty Burrell and Julie Bowen. It was not only a fun and creative day, but a learning experience. The cast and crew of MF are so loving, playful and welcoming that it was an absolute pleasure to work with all of them and be invited into their playground. I don’t want to give away the scene, but I will be in the second episode of the new season of "Modern Family" this fall. Let’s just say I do some grocery shopping with Phil and Claire. You have also begun shooting a pilot. What has that been like for you? 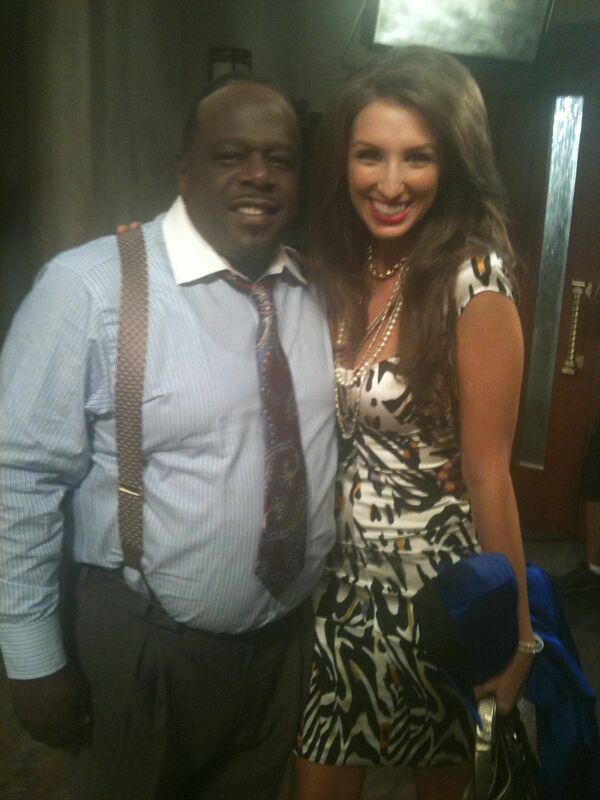 I am currently working on a new Pilot called “All Rise” starring Cedric The Entertainer. It is a courtroom comedy with Judge Peirce (Cedric). I play a distraught mistress to a convicted Mobster who has a run in with the mobster’s wife in the courthouse. It’s very funny and crazy, like something out of “The Real Housewives of New Jersey”. I play Rosana, a woman with big hair and a big attitude, who knows what she wants and knows how to get it, or fight for it, literally. I just want to act. To just do what I love and become a consistently working actress. I admire the careers of Judy Greer and Jennifer Coolidge. Most people don’t know them, at least not by name, but have likely seen them in countless movies and shows. They are two brilliant actors whose resumes exceed most, but aren’t all over the tabloids. I would love to do half the work they have done, and at the end of the day still be able to live a fairly normal life. All I have ever wanted was to act and I thank my lucky stars every day I have been given the opportunity. Know what you want and go for it. Work really hard and become the best you can possibly be at your craft. Never stop training and be prepared for a long and wild journey. It can be very difficult and grueling, so find a good support system along the way. If you put your heart into it and work hard, the reward can exceed all expectations. If this is what you want be hands on and proactive, and at the end of the day remember to be true to yourself and what you have to offer.